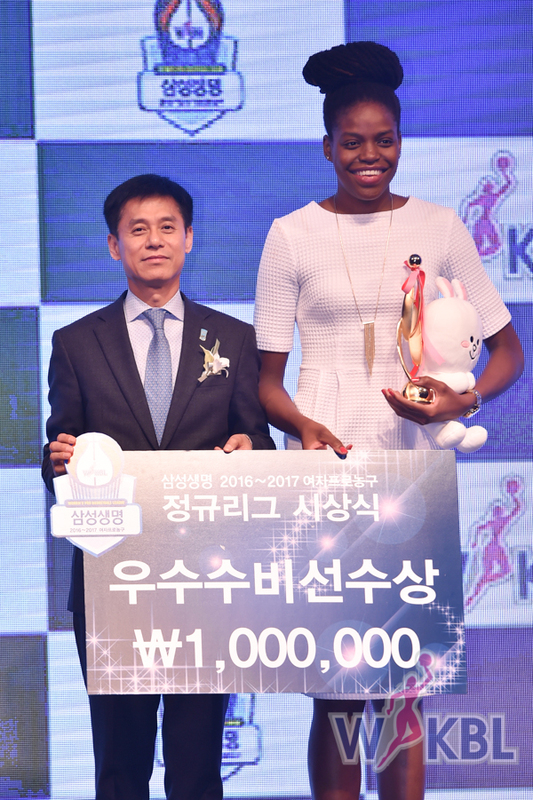 In her first season overseas Jonquel Jones brought home plenty of hardware at today’s Korean League awards ceremony. After leading her team to a Korean League best record of 33-2, the best record in the history of the WKBL, Jones finished with averages of 15 points per game, 13 rebounds and almost 3 blocks per contest. Today’s ceremony was a day of celebration after a hard fought season in which the final playoff spot was not determined until the last week of the season. Not only was Jones named the foreign MVP of the league but she was also selected as the Defensive Player of the Year and named ‘Best Five’ in the league. Connecticut Sun forward Alyssa Thomas was also named to the ‘Best Five’ team. The Korean League playoffs begin on March 10th as Alyssa Thomas and Samsung will take on Plenette Pierson and KB Stars. The winner of the best of 3 series will then face Woori Bank who has to wait until the 16th of March to start their championship quest. Woori Bank will be going after their fifth consecutive Korean League Championship! The Korean League playoffs are finally set! Outside of Woori Bank, who clinched the regular season with ten games to play, everyone else had a chance to fill the last two spots. Soon after, Samsung was the favorite to take the second spot and the third was wide open. It could have come down to the last and final game of the season between KDB and KB Stars but KDB was unable to defeat Shinhan Bank on Thursday to give them a chance to play for third and final place. Instead, with their loss, KB will take the final playoff spot. It comes as a surprise as KB sat in the cellar of the standings for quite some time. It wasn’t until rookie sensation Park Ji-soo joined the team and began to take over as one of the best players in the entire league. In her first season in the WKBL Park is averaging a double double of 10 points and 10 rebounds. She’s also dishing out almost three assists per game. Woori Bank will wait for the winner of the best of three series between KB and Samsung. Samsung will have home court advantage as game 1 will take place on their court, game two will be at KB, and if necessary, game 3 will be back in Samsung’s gymnasium. Playoffs start March 10th. The finals will begin on the 16th of March. The 6th round wrapped earlier this week and the 7th and final round is underway. Woori Bank and Samsung have already punched their tickets for the postseason while the other four teams are in a heated race to clinch the final spot. For winning the regular season, Woori Bank automatically advances to the finals while the other two teams will play a best of three semi-final series. On Wednesday Woori Bank visited Samsung in Yongin. Samsung was back to having only one foreigner available as Alyssa Thomas had to play all 40 minutes of the game. Down by 16 at the half, many thought the game was over. However, Samsung rallied back in the third and eventually tied the game up in the fourth quarter! Despite the best efforts of Thomas who finished with a double double, Woori Bank, who saw both foreigner players foul out the game, prevailed and won 85-72. On Thursday an important game between KB Stars and KEB Hana went to KB 63-70 as they continue to rise in the standings after sitting at the bottom for most of the season. Woori Bank were on the road again on Friday but this time they were up against Shinhan Bank who are in desperate need of a win. Shinhan had to play with only one foreigner as they just brought in a replacement for Alexis Vaioletama who left the team for personal reasons. Shinhan is one of two teams that have beaten the defending champions this season and were hoping to take them down again on their home floor. 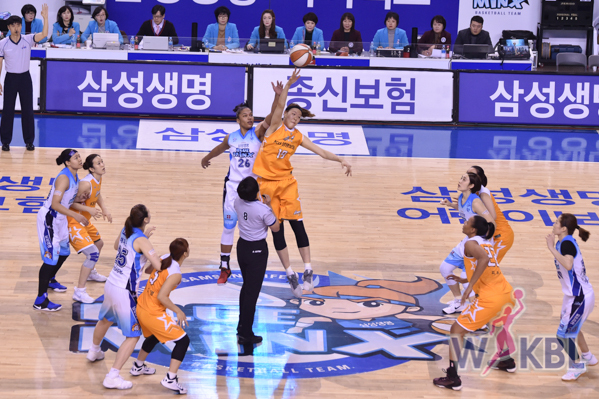 Shinhan played a close game throughout and were tied with Woori to start the fourth quarter. Woori turned up the heat and outscored Shinhan 26 to 6 to finish the game winning by 20 58-78. Another heavy load for Alyssa Thomas and Samsung as Thomas had to play another 40 minute game. Samsung took a three point lead into the half and slowly pulled away in the second. Winning 87-73 assuring whichever team they face in the semi-finals that they will be tough to beat. Sunday’s game was a thriller between KB Stars and KEB Hana. A close game throughout, it came down to the last minute to decide its winner. The road team Hana Bank had the lead down the stretch but KB hit two big threes to pull within one point in the last minute of the game. A turnover on their next possession led to an easy layup by KB which gave them a one point lead and eventually the game 60-59. KB’s rookie sensation Park Ji-Soo was just one rebound shy of a triple double. She finished the game with 13 points, 9 rebounds and 11 assists! With this win KB sits in third place in the standings. With most teams having just six games remaining in the regular season things couldn’t be any more interesting in the Korean League. First placed Woori Bank already clinched the regular season and a spot in the finals while Samsung will also compete in the playoffs but the seedings can change. Only three teams make it to the playoffs with the first placed team automatically playing in the finals. KEB Hana, KB Stars and Shinhan Bank all have the same 11-18 record! KDB is currently in third place with a record of 12-18. For the 7th and final round of the league every game will be more than important for everyone. After clinching first place, Woori Bank changed their line-up to give other players a chance to play but moving forward they are likely to get back to their original lineup in preparation for the finals. Although Samsung will definitely be playing in the playoffs they must continue to win if they want to have home court advantage. The other four teams will fight in out for the last available playoff spot. Shinhan Bank will have to incorporate another new foreigner as Alexis Vaioletama decided to leave the team for personal reasons. KB Stars have dug their way out of the bottom of the standings after their rookie sensation Park Ji-soo gained more confidence and is playing incredible for the team. They now have a chance to make their way back to the playoffs where they lost last season in the semi-finals to KEB Hana. KDB has missed the playoffs for the past four seasons. They have a chance to ease a lot of disappointment they’ve experienced the last several seasons. KEB has had an up and down season to say the least. After losing every game in the first round of play, they changed course and won all but one game in the second round. Since then, there hasn’t been very much consistency. Either way, there will be some great games coming soon. Be sure to check back and find out who will make their way to the playoffs!